# ./bitehist.py Tracing... Hit Ctrl-C to end. tools/argdist: Display function parameter values as a histogram or frequency count. Examples. tools/bashreadline: Print entered bash commands system wide. Examples. tools/biolatency: Summarize block device I/O latency as a histogram. Examples. tools/biotop: Top for disks: Summarize block device I/O by process. Examples. 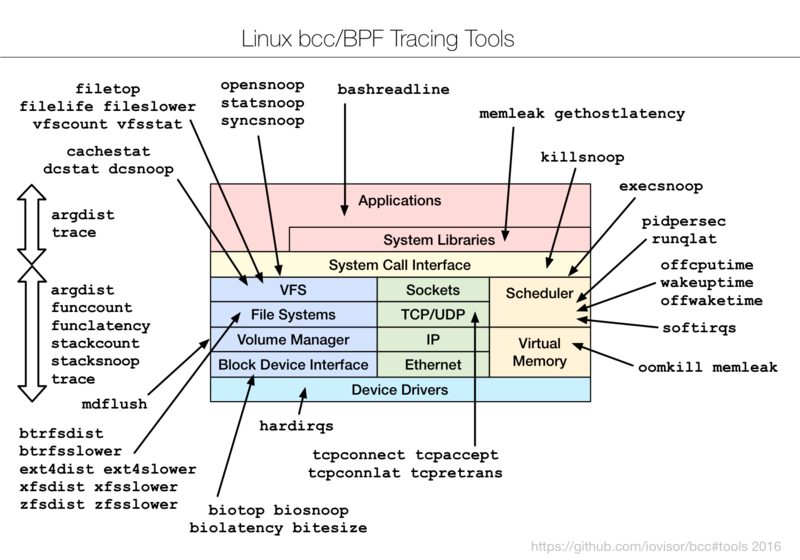 tools/biosnoop: Trace block device I/O with PID and latency. Examples. tools/bitesize: Show per process I/O size histogram. Examples. tools/btrfsdist: Summarize btrfs operation latency distribution as a histogram. Examples. tools/btrfsslower: Trace slow btrfs operations. Examples. tools/cachestat: Trace page cache hit/miss ratio. Examples. tools/dcsnoop: Trace directory entry cache (dcache) lookups. Examples. tools/dcstat: Directory entry cache (dcache) stats. Examples. tools/execsnoop: Trace new processes via exec() syscalls. Examples. tools/ext4dist: Summarize ext4 operation latency distribution as a histogram. Examples. tools/ext4slower: Trace slow ext4 operations. Examples. tools/filelife: Trace the lifespan of short-lived files. Examples. tools/fileslower: Trace slow synchronous file reads and writes. Examples. tools/filetop: File reads and writes by filename and process. Top for files. Examples. tools/funccount: Count kernel function calls. Examples. tools/funclatency: Time kernel functions and show their latency distribution. Examples. tools/gethostlatency: Show latency for getaddrinfo/gethostbyname calls. Examples. tools/hardirqs: Measure hard IRQ (hard interrupt) event time. Examples. tools/killsnoop: Trace signals issued by the kill() syscall. Examples. tools/mdflush: Trace md flush events. Examples. tools/memleak: Display outstanding memory allocations to find memory leaks. Examples. tools/offcputime: Summarize off-CPU time by kernel stack trace. Examples. tools/offwaketime: Summarize blocked time by kernel off-CPU stack and waker stack. Examples. tools/oomkill: Trace the out-of-memory (OOM) killer. Examples. tools/opensnoop: Trace open() syscalls. Examples. tools/pidpersec: Count new processes (via fork). Examples. tools/runqlat: Run queue (scheduler) latency as a histogram. Examples. tools/softirqs: Measure soft IRQ (soft interrupt) event time. Examples. tools/solisten: Trace TCP socket listen. Examples. tools/stackcount: Count kernel function calls and their stack traces. Examples. tools/stacksnoop: Trace a kernel function and print all kernel stack traces. Examples. tools/statsnoop: Trace stat() syscalls. Examples. tools/syncsnoop: Trace sync() syscall. Examples. tools/tcpaccept: Trace TCP passive connections (accept()). Examples. tools/tcpconnect: Trace TCP active connections (connect()). Examples. tools/tcpconnlat: Trace TCP active connection latency (connect()). Examples. tools/tcpretrans: Trace TCP retransmits and TLPs. Examples. tools/tplist: Display kernel tracepoints or USDT probes and their formats. Examples. tools/vfscount tools/vfscount.c: Count VFS calls. Examples. tools/vfsstat tools/vfsstat.c: Count some VFS calls, with column output. Examples. tools/wakeuptime: Summarize sleep to wakeup time by waker kernel stack. Examples. tools/xfsdist: Summarize XFS operation latency distribution as a histogram. Examples. tools/xfsslower: Trace slow XFS operations. Examples. tools/zfsdist: Summarize ZFS operation latency distribution as a histogram. Examples. tools/zfsslower: Trace slow ZFS operations. Examples.